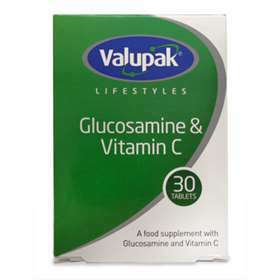 Valupak Glucosamine + Vitamin C 1500mg 30 Tablets A food supplement specially formulated to provide nutritional support for healthy joints. Glucosamine is a naturally occurring constituent found in connective tissues, where it plays an important role in the production of cartilage, tendons and ligaments. If pregnant or planning pregnancy seek medical advice prior taking supplements. Do not take if the blister pack is open or broken. Glucosamine Sulphate 2KCl, Magnesium Stearate (Anti-Caking Agent), Hydroxypropylmethylcellulose, G lycerin, Vitamin C(As Ascorbic Acid), Silicon Dioxide (Anti-Caking Agent).